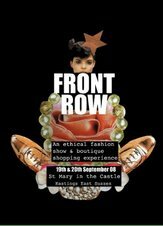 Front Row is a fashion show with a little more than good clothes sense - it's got good ethical sense, that is, a conscience. Coinciding with London Fashion Week, Front Row has much to compete with but given the heavy emphasis in the glossies on the eco fashion chic this year, and the fact that it is a not-for-profit initiative, this earth friendly fashion show is sure to prove extremely popular. Front Row Ethical Show and Fair 2008 arrives this Friday the 19th and Saturday the 20th of September and will be hosted at the St Mary's in the Castle in Hastings, East Sussex. Over twenty designers will be showcasing some of the best ethical, organic, fairtrade, vintage and recycled designer wear and accessories in the UK. There will be a boutique style fair on the Saturday in which fashionistas can buy their very own designer greens from a number of stalls offering locally produced garments made with organic materials. Beyond the local contingent of designers will be leading ethical clothing brands Howies, People Tree, Enamore and TRAID. There will be a catwalk show on the friday night at 7.30pm. One showing will include recycled garments by From Somewhere, from Orsola de Castro who is responsible for Estethica, an initiative started by the British Fashion Council to promote the best in eco-sustainable fashion. This collection is made entirely from discarded materials salvaged from fashion industry waste which is used to create beautifully crafted eco chic garments. Other star collections are bound to be in the Paper Couture section of the show where some wacky and innovative creations are predicted to hit the catwalk. Let's hope they do exactly that! To show your support and to find out where you can buy tickets visit the Front Row website.